No lie, this is the best meat dish that I have ever made. Full disclosure, I don’t cook many meat dishes (except BACON). But this recipe is difficult to botch. It may look labor intensive, but trust, it’s not. It just takes a little bit of time. 1) Cut the pork putt into ~2 inch square chunks. Also, remember not to trim any fat from this relatively fat-laden cut. This is all of the flavor, and you want it in this dish. 2) Take these chunks and place them in a dutch oven (or similar pot) with the citrus juices above and salt/pepper to coat. The original instructions say to fill with water just enough to cover the meat. Bring to a boil then reduce to a simmer (uncovered) for 2 hours. *In my experience, even at a simmer, I kept adding water almost every half hour or so to prevent running dry. Perhaps my simmer was too aggressive, but remember to keep an eye out if more water is needed. Otherwise, forget about this meat, let it do its thing. 3) After 2 hours, raise the temperature to medium-high until any remaining water is evaporated. You will be left with fall-apart pork and residual fat. Now is the time to return to the stove and cook this pork to crispy, crispy goodness, stirring as needed. Mix all of this up, and if possible, let sit overnight to let all of the flavors mingle. It. Is. Killer. 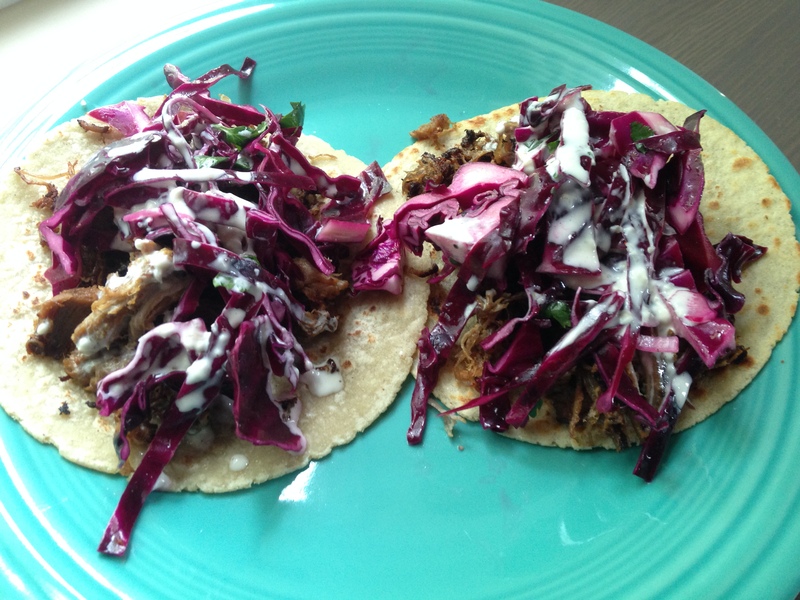 There are numerous sauces that would be delicious on a carnitas taco, but a friend shared this recipe with me, and I knew that it would be amazing. 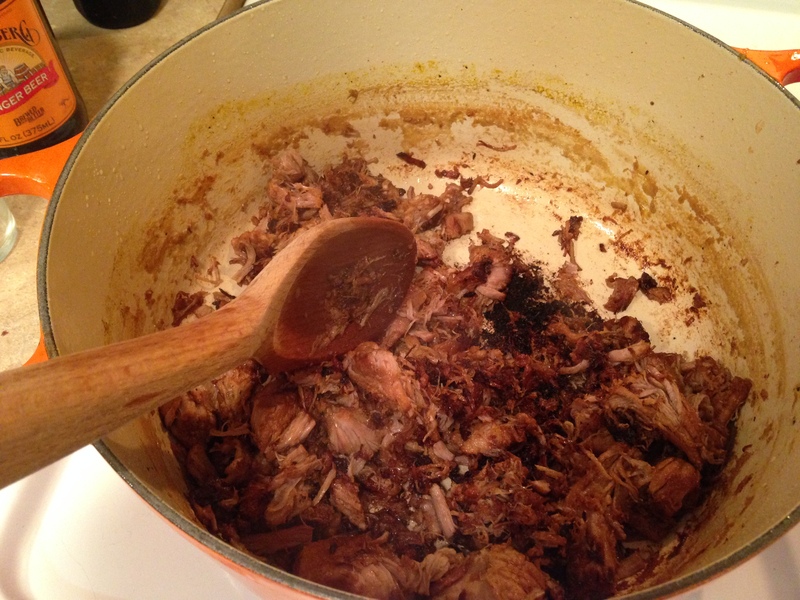 This recipe below is traditionally used on barbecue, to my understanding, but its slightly sweet flavor perfectly balances with the salty, savory carnitas. It may also be tweaked a bit spicier, depending on preference, by adding more cayenne or horseradish. *Note – I’ve never purchased real horseradish in the grocery before, and after searching everywhere in the aisles, to no avail (only horseradish mayo-based sauces). I found horseradish in the dairy section (with help) refrigerated by the cream cheese. Go figure. I might also suggest garnishing with another squeeze of lime, extra cilantro, or avocado if you have some around. Enjoy.